The Malayalam language film Ezra starring Prithviraj Sukumaran in the lead, released in 2017. This was one of the highest grossing Malayalam films of that year. The Malayalam film was directed by Jay Krishnan and so would be this Hindi remake. Yes, Jay would be directing the Hindi version of Ezra and Emraan Hashmi has been confirmed to play the lead role. After Lucifer, Prithviraj Sukumaran to Team Up With Writer Murali Gopy Again for His Next? This Tweet Hints So! 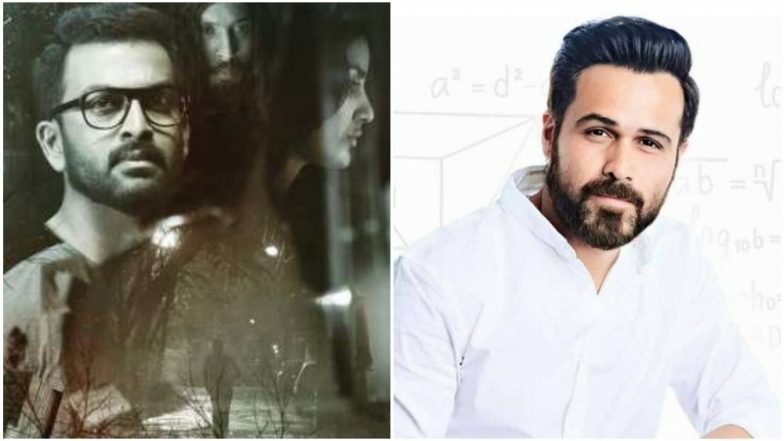 Talking about this next-gen horror Emraan Hashmi was quoted saying, “Horror is a genre with immense potential, a well-made horror film will always draw audiences in huge numbers to cinema halls. With Ezra, we hope to push the boundaries further and give the audience an experience that they will never forget. I'm happy to be associating with Kumarji and Abhishek on this film and with Jay Krishnan at the helm of things all I can say is be prepared for one hell of a spooky ride.” Amitabh Bachchan and Emraan Hashmi Starrer Untitled Film All Set to Go On the Floors, Producer Anand Pandit Holds a Pooja Ahead of Shoot. The Malayalam version of Ezra starred Priya Anand opposite Prithviraj Sukumaran. Which actress would be roped in opposite Emraan Hashmi is yet to be announced. Tovino Thomas was also seen in a pivotal role. The upcoming film produced by Bhushan Kumar, Kumar Mangat Pathak, Krishan Kumar and Abhishek Pathak will be extensively shot in Mumbai and Mauritius. With this remake, Jay Krishnan would also be making his debut in Bollywood. Stay tuned for further updates.